This is only a partly completed project. 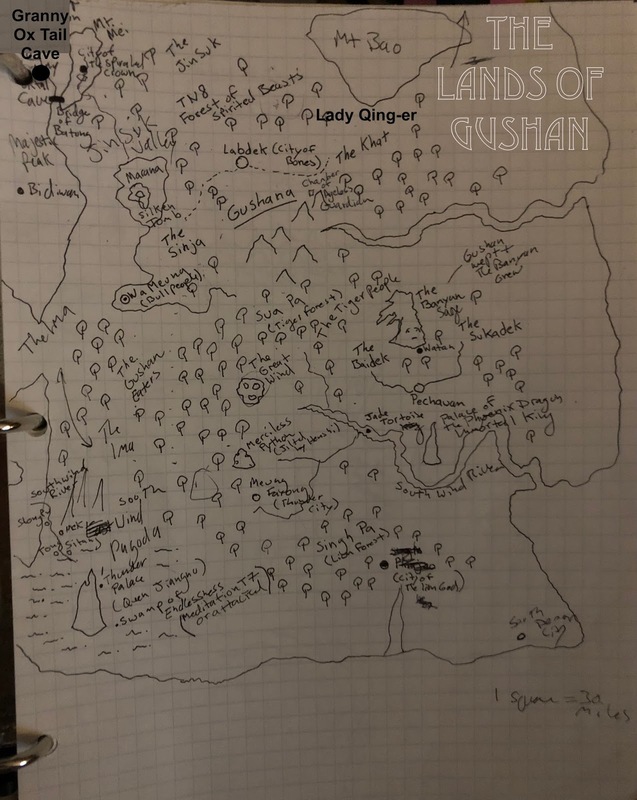 It is what I have so far for the areas south of Hai’an in the Wandering Heroes of Ogre Gate setting. It is only about 1/4th complete but I am releasing it for the reasons stated in my WAR OF SWARMING BEGGARS introductory post. The reason I am releasing it is so that people at least have the material if this part of the world comes up in their games. The concept behind the southern regions is to emulate Journey to the West style play. 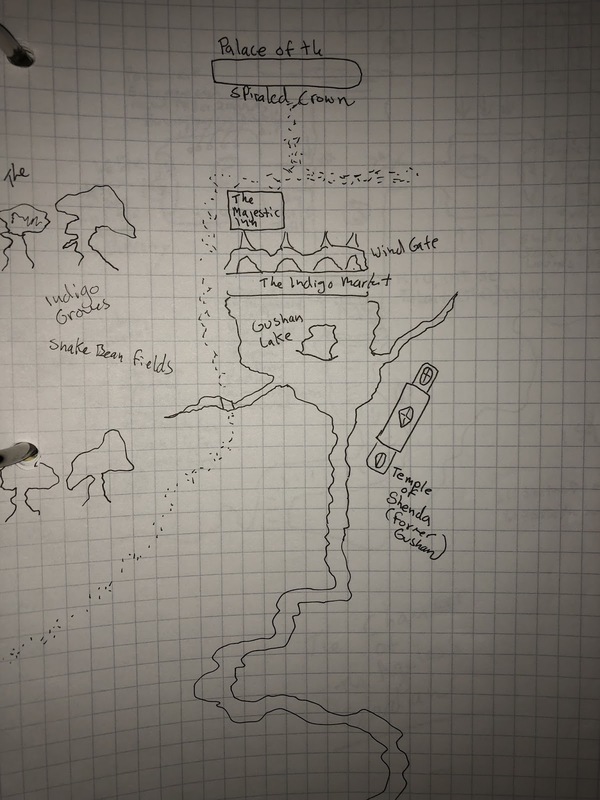 Essentially this is an area of the setting where that kind of mythic adventure becomes possible because the Enlightened Goddess is unable to reach here effectively (it is a kind of wild west of the Heavenly Bureaucracy). I decided to reduce the number of chapters in this book because of its current size. So it begins with an overview and gazetteer. This is followed by Kung Fu and Rituals, then by new Objects. I will link these like I did the WAR OF SWARMING BEGGARS book. The lands in this book are all those found south of Hai'an. The South is a place of dense forests, high mountains, and enormity. The animals and plants of the south are much larger than their counterparts elsewhere, and many of them are spirited. Here, powerful spirited beasts, hunted gods and primordial deities rule. There are many gods in the south. Some of the most important are wind gods. 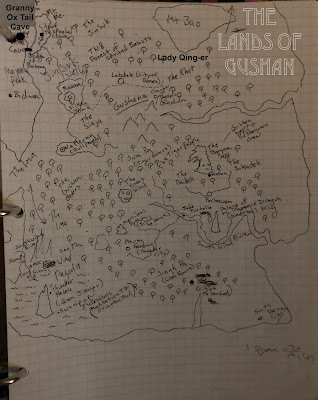 And there are many southern wind gods, but none more feared or strange than Gushan. According to legend, the Enlightened Goddess cut her own strands of hair to make Gushan. The influence of Gushan is strong in the lands south of Dhamma and Hai’an. Here reality itself seems to break down. The people, the places, the cities and the geography abide by their own rules. In the south travelers find kings made of fire who rule on blackened thrones, cities populated by spirits and blood worms, forests patrolled by flying crocodiles and animal civilizations. Traces of the Enlightened Goddess and her bureaucracy are felt but her presence is weak and it is a favorite location for those wanted by the heavenly bureaucracy to seek refuge. The Enlightened Goddess herself fears the south. Anytime she has ventured into these lands, she forgets who she is. At times this led to her assuming human form and living out a full life as a mortal without realizing her own power. High ranking members of the celestial bureaucracy suffer similar consequences when they come here (provided they still retain their title and post). Where did mankind originate? The answer to this question is simple say the worshippers of Gushan: we are all Gushan. The principles of Gushan are both opaque and basic. What matters is the world of man, the imperfect realm. In truth it isn’t imperfect, the flaw is with the perfect realm. Rather than emulate the perfect realm, like they do in the north, it is better to reshape the world in the image of mankind. For man is divine and the restraints placed upon him by the dehuans, the worshippers of Hen-Shi and even the Yen-Li practitioners are unnatural. The particular ethics vary from group to group, priest to priest and community to community, but the starting point is always mankind. Some sects devoted to Gushan are very literal in their beliefs, some are much more symbolic. For the more symbolically oriented groups, at the higher levels of cultivation believers begin to understand that the winds of Gushan, the idea that he can destroy reality in the wake of his breath. To them this is also a symbol for man’s ability to defy fate. It is difficult to resist, but the will of heaven can be challenged. A fundamental feature of Gushan worship is prophecy and veneration of Little Winds. Little Winds are statues with multiple open-mouthed heads forming a mass. When powerful winds flow through them, they can be heard to speak prophecies. Sometimes these prophecies address the listener directly. Sometimes they address the general nature of things. If the former use the Prophecy Table below. If the latter use the Table of Future Events from page 430 of the WANDERING HEROES OF OGRE GATE rulebook. In addition to Gushan, many people and creatures in the southern lands worship large animal gods, spirited beasts, fallen gods, and other types of beings. Some gods from the larger pantheon of Qi Xien are also present here. For example, Jiangnu the southern wind goddess, Queen Jiangnu resides at her palace in the Swamp of Endlessness. Often gods will be cast out from the Heavenly Bureaucracy or need to go into hiding, and they find a place for themselves here. From time to time, Little Winds issue prophecies. These prophecies are not just glimpses into the future, they help create it. Anything uttered by Little Winds, lends tangible weight to those events occurring in the future in the form of bonuses and penalties. So if the heads say “You will be crushed by a Raksha” then the next time that character faces a Raksha, it gains a +1d10 Bonus, while the player might gain a –1d10 Penalty. To determine the prophecy, use the table below, but feel free to modify or adjust to customize to your characters. NOTE: This table is also found in WAR OF SWARMING BEGGARS. These are a people who roam in tribes in the south. The Jin Suk do not speak and consider facial expressions a sign of close intimacy (so to other’s their expressions often seem blank). They occasionally venture north and frighten the natives there with their silence and unusual manners. Jin Suk cut out their tongues when they are children. They call speaking ‘wind’ and cut out their tongues to avoid ‘evil wind’. Therefore, they communicate by silent hand gestures. Empty Dantian: You take 1 wound any time you fail in using a Neigong Technique. This vast tree is nearly a mile at its base and rises high into the sky. It can be seen from 60 miles away. The tree was born from the tears of Gushan. The people say “Gushan wept, and the Banyan grew.” Locals worship the tree as a kind of relic, and organize martial contests around it. When the blood of 100 heroes is spilled, the tree speaks. This long stone bridge spans Majestic Peak and Mount Mei. There are strange Gushan statues flanking the way, made to look like large bellies with massive faces and strange eyes (They have no discernable head or limbs). The bridge itself spans fifteen miles, and anyone with knowledge of such matters can tell the design is impossible. The bridge seems to be in a crumbling state most of the time, but oddly restores as people pass over it. This is because it feeds on the life of anyone walking by the bellies. The bridge has a widely known reputation and local heroes often prove themselves by crossing it. As people pass by they grow weak and feel increasingly hungry. They lost 1 wound each mile they travel. This is reduced to 1 wound every two miles if they eat constantly while passing. If anyone should die while passing by, the bellies issue a highly accurate prophecy but clouded in obscure language. When a prophecy is issued, Roll on the Table of Future Events on page 430 of the WANDERING HEROES OF OGRE GATE rulebook. This event will occur unless events in the campaign prevent it. The bellies speak about the events but are often poetic in their description. This city of competing gods is ruled by a vast priesthood, forming a council with representatives from each godly sect. The most influential god in the city is the Lion God, Phra Singh. The second most influential is the Snake Goddess Phra Guo, There is also a temple dedicated to the southern sea god. They are small but routinely send barges of virgin sacrifices to a far off island where they believe the southern sea demon resides. The gods in question dwell beneath the city and can be accessed through the temples dedicated to them. The clans of this city feel compelled to obey whoever wears the spiral crown. Ten years ago they served Granny Ox tail, now they serve Queen Su Qian, a Bone Demoness. She keeps a man named Wan Mei as her chief consort. Su Qian stole the city and Wan Mei from Granny Ox Tail many years ago (See GRANNY OX TAIL’S CAVE entry below for details). The people of the city mainly speak Singh. The city is an important trade hub, and it also exports indigo as well as many other dyes. They cultivate a range of vegetables and grain but subsist largely on a local variety Snake Beans that are particularly protein rich. The Majestic Inn is a highly regarded place to stay. Rooms cost the equivalent of 20 spades a night. Operated by Chomkwan, a great hero who retired after she vowed to serve Hen-Shi. She is one of the few people in the city who venerates the goddess. The inn is known for its Zhen Bird soup. The locals play a gambling game that involves guessing the number of sticks beneath a turtle shell. Chomkwan is the owner of the Majestic Inn. She was once a great hero, having defeated the demons: Fire Bearded Queen, Ten-Eyed Lotus and The Spine Snake of Sukadek. Chomkwan is tall and slender, and dresses in purple trousers and shirts. She fights with a bian. Chomkwan had a vision of Hen-Shi after she killed Ten-Eyed Lotus. Hen-Shi told her to go to the City of the Spiral Crown, subsist on snake bean and give up meat. From now on she would redeem rather than destroy the demons. Queen Su Qian is a powerful Bone Demon. She looks like a normal human when viewed by daylight. But under moonlight or in reflected surfaces her true appearance, as that of a bony corpse, is visible. She needs virtuous flesh to survive so routinely has her people invite great heroes. Bite and Virtuous Hunger: The bite of a Bone Demon inflicts 6d10 Open Damage and drains 1 point of positive Karma. Every point of Karma the Bone Demon drains increases its max Wounds by 1 permanently. If it consumes a person who has good Karma in a single sitting, it extends its life by 1 month. If it consumes someone who is truly virtuous (a person with 10 Karma) in a single sitting, it extends its life by 200 years. Bone Spear: The ribs and other bones of a Bone Demon can shoot out suddenly and impale foes (striking everyone within a ten foot area). Roll Bone Strike against Parry. On a Success this inflicts 4d10 plus 2 Wounds. On a Total Success it inflicts 4d10 Open Damage plus 3 Wounds (and an Extra Wound for each additional Total Success). Illusions: A Bone Demon can weave a very convincing illusion to make it appear like a normal human. This can be any type of human it wishes (old, young, beautiful, ugly, tall, short, and so forth). However, the illusionary transformation inflicts a single Wound on the Bone Demon. It lasts for as long as the Bone Demon wishes or until someone magically forces it to end. This illusion cannot be detected by normal means. Only the most powerful magic can see through it. Waste Away: Bone Demons are on the brink of death and must consume virtuous flesh to survive. A normal person can extend the demon’s life by a month, a virtuous person can extend its life by 200 years. Without eating the flesh and extending their life in this way, they must make a Meditation roll TN 7 every week or die. This ancient tomb is described fully in TOURNAMENT OF DAOLU, pages 5-8 (this book is PWYW). This large cavern is in a valley-like ledge high on Majestic Peak. Before the entrance are numerous chains tethered to nearby boulders, with skeleton remains upon the ground. Sacrifices are brought here by the villagers of Sa-un. Granny Ox Tail is a powerful giantess who lives within the cave. While she enjoys eating people, she is willing to teach those who want to learn about Gushan and pay proper respects. Granny Ox Tail is a giant creature, who lives in Majestic Peak. She has three eyes, four arms, each holding a massive ox tail dao, and eight horns circling her head from her crown to her jaw. Once a month the people in the area bring her a sacrifice to feed on. She worships Gushan and has come to believe that her physical appearance is an expression of her true humanity. Background: Granny Ox Tail was born in the city of Labdek many years ago. She seemed a normal child and grew to be a great beauty. She enjoyed her exceptional looks and was proud. However, she didn’t realize that she was the secret daughter of Lord Demon Horn. She was conceived in lust during a chance meeting on a battlefield. Lord Demon Horn and her mother were lovers for a night, but went their separate ways. Granny Ox Tail became a famous sword maiden (then she was known as Ox Tail Immortal), but with each kill her demon-nature grew and her body began to change until she became the mighty creature she is today. Granny Ox Tail used to rule the city of the spiral crown, but she fell in love with a mortal who betrayed her and stole the spiral crown (giving it to the Bone Demoness Su Qian). She now longs for revenge against Su Qian and the mortal (Su Qian’s present lover), Wan Mei. Mighty: All melee attacks by Granny Ox Tail do 2 Extra wounds. Weakness: Any object made of Jade inflicts 3 Extra Wounds against her. Four Arms: Granny Ox Tail has four arms like a Juren and is able to make two skill rolls simultaneously when appropriate as well as make one additional attack each round. There is a giant turtle with a whole city inside his belly. He devours people to help grow his civilization. The city is called Shui Huo and ruled by South Wind King, keeper of the Starlight Lamp. According to legend this ancient device is the source that powers the starlight at night. South Wind King is very powerful and has mastered something called 18 Fire Point Technique. With a mere look he can incinerate his foes. In truth the Jade Tortoise is a split entity. His other half is the South Wind King who rules the city inside his belly. Background: South Wind King began life as a water turtle with three burning streaks upon his shell. The Enlightened Goddess, in one of her forgetful states, happened to see him one day and fed him carp from her jade pond giving him the power to cultivate. For three centuries she reclined at the edge of his river playing the guzheng and he dutifully appeared each morning to hear. Over time the turtle’s phoenix spirit and dragon spirit began to split. The result was his phoenix spirit formed the giant Jade Tortoise that roams the South Wind River, while his dragon Spirit became the South Wind King who lives inside the Jade Tortoise..
After this occurred, the Enlightened Goddess, thinking it was just a minor trinket, entrusted him with the Starlight Lamp. Flames of the Sword (Neigong Qi 6): You swing your sword and a burning arc forms striking all before you for 6d10 Fire Damage. Cathartic: This does 6d10 Fire Damage plus 4 Extra wounds. Only evasive counters work against it. Whirling Vortex of Flame (Neigong Qi 6): You bring forth a tornado of hot wind and fire (using your preferred melee attack method). Roll against Evade of targets within 20 feet per rank of Neigong. Targets sucked into the vortex taking 4d10 Fire Damage, plus they are hurled for 3d10 Falling Damage. Cathartic: 6d10 Fire Damage plus 6d10 Falling Damage. Fire Resistance Technique (Neigong Qi 5): Make an endurance roll against any fire or heat based attack or element to resist its effects. Must be used cathartically. This tribe of people dwell south of Mount Bao, worship the great Tiger God of Sua Pa. They adorn their bodies in tattoos of their god and those they have defeated. They live to serve Sua Pa and bring him feed. Anyone they encounter they try capture and leave tied to trees in Sua Pa’s territory. They hold the Tiger People in great respect. See SUA PA for further details. See TOURNAMENT OF DAOLU, page 4 (this book is PWYW). A city built upon the wasted bones of mighty demons atop a massive Sulphur deposit. Here there are houses and temples to Jiangnu erected from the skulls and hip bones of elephant demons and other such creatures. But also the seat of a great ruler called the Devouring Queen. The Devouring Queen despises Gushan and uses her Devouring Wind to fray the flesh of demons. Followers have sought her protection and she has taught some of her people how destroy demonic creatures. The people here are skilled craftsmen and extract Sulphur for their Queen. They also fashion her thunderbolt balls, which she fills with divine powder that she makes herself. The city is known for its finely made garments which often employ indigo imported from the City of the Spiral Crown. The people here despite the Jin Suk. They do not cut out their tongues, and they despise this practice. They worship worthy gods such as Supreme Judge Yu, Jiangnu, Jade Tortoise King and Yao Yun. Lebdeki have tried to erect temples honoring the Devouring Queen but she refuses, lest it make her a demon. The Devouring Queen has cultivated a strange type of Qi energy, a perfect balance of Dragon and Phoenix that creates an incredible well of emptiness in her Dantian. This allows her to create a powerful sucking wind. It is harmful to mortals, but especially dangerous for Demons. Her Kung Fu is unique in the world. No one else has mastered this technique. Immortal Powers: Enchanting Whisper (Convince person you are friend on successful persuade roll). Immunity: Affected only by Kung Fu and Magical attacks. Merciless Python is an enormous constrictor snake with a trail of sharp black hair along his spine. A rampaging snake god, worship by man eating serpent men. Hates the world. Hen-Shi refused his advances so he vowed to kill until she relented. He is particularly fond of devouring monks and anyone associated with Hen-Shi. Bite and Constrict: Merciless Python’s bite does 5d10 Open Damage. Anyone struck is constricted and begins to suffocate. They can escape by making a successful opposed Muscle Roll or delivering 10 wounds to Merciless Python. Ripping Hair: The needle-tipped hair along his spine can reach out rapidly and dig into human flesh, to rip open peoples’ bodies. Make a Hair Strike Roll against the Evade of anyone in a 50 foot area around Merciless Python. On a Success they take 4d10 plus 4 Extra Wounds. On a Total Success they take 4d10 plus 8 Extra wounds. Wounds inflicted in this way take 1 week each to heal. Anyone killed by this attack is torn apart by the hair. This treacherous peak rises high like a tall spire. The spire itself overlooks a much lower hanging valley (which has an elevation of about 400 feet and is dense with jungle). The hanging valley supports the City of the Spiral Crown (See CITY OF THE SPIRAL CROWN for details). The sides of the mountain (even the cliffs of the long hanging valley) are particularly dangerous and difficult to climb. Climbing them is a TN 10 Athletics roll or TN 8 Survival (Mountain) Roll. Zhen Birds are common here. There is a 2 in 10 chance of encountering 1d10 Zhen Birds every day. This is a tomb composed entirely of silk threads, but they are densely packed. Many say it is the tomb of Gushan and that the silk is his hair. In truth, this is the tomb of a great sage. His tomb houses the Bronze Mirror of Gushan (see entry in CHAPTER THREE). These creatures look like giant Silk Moths with 20-foot wing spans. Their bodies are thick with gray hair and their features radiate hunger. They can spin long encasing webs and drink their foe's blood with a long proboscis tube. Silk Moth Demons are created when spirited silk worms cocoon. To cocoon, they must assume human form, starve themselves and cut out their insides. Their body then acts as a cocoon for their spirit to shape into a Silk Moth. Devouring Limbs: The spiky legs of a Silk Moth Demon can shred flesh and pull out hair. On a successful Devouring roll against Parry, the creature peels off sections of skin and hair for 4d10 Open Damage plus 2 Extra Wounds. Blood Drain: Silk Moths have a long proboscis that has a range of 20 feet. Roll 4d10 against Parry. On a Success the proboscis impales the target and the moth drinks their blood like nectar. Instead of doing damage, the Moth drains 2 Hardiness each round it succeeds on this attack. Immunities: Silk Moth Demons are immune to all normal attacks, only taking damage from Kung Fu techniques Qi level 1 or greater. This forest is populated with large flesh hungry lions. 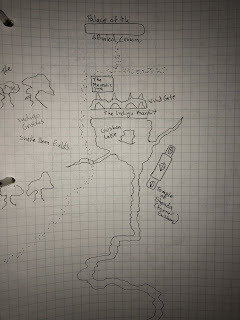 Anyone passing through must make an additional Survival (Wilderness) roll TN 7 or encounter 1d10 Giant Lions. Pounce: Big cats stalk and pounce on their prey. When a Giant Lion gains surprise, it does Open Damage and gets 1 free attack. This river is remarkable for its pure flowing waters and the lush land on its banks. Despite its proximity to the Swamp of Endlessness, or perhaps due to this, it is quite fertile. There are hundreds of small villages along the river but four sizeable settlements of note: Mek ,Tong, Sitang and Shongpu. All of the villagers speak Singh and worship Gushan, Yao Yun and Jiangnu. However, they recently began worshipping a deity named Glimmering King. His representative, Swimming Priestess comes to the villages and demands valuable objects to give to Glimmering King. If she is not satisfied, then the waters of the river take the eyes of anyone who enters them. The treasures presented for Glimmering King have all been fused into a contorted monstrosity on a small island in the river. This strange statue of jade, gold, silver and curious items, towers high into the sky. There are many highly valuable objects in here. Anyone who searches is and gets a 10 on their Detect roll has a 1 in 10 chance of spotting an Object of Power. There are quite a few of note here. Among them are the Claws of Cha and Dagger of the White Phoenix (see Objects of Power chapter of this book). Glimmering King is a large spirited crab but he can also take human form. He and Swimming Priestess (a Fish Demon) are in love and amassing wealth to present to Yao Yun so they can be married. Both are escaped Servants of Yao Yun. Sand Blast: He can release an 80 foot cone of sand that shreds anyone caught inside as a free action. Roll 3d10 against the Evade of all affected. On Success they take 1 Automatic Wound, plus suffer a -1d10 to Detect for an hour. On a Total Success the target’s are blinded for three rounds. Weakness: Stone weapons do 4 Extra wounds. Crab Swarms: Each round he is protected by swarms of Crabs. These act as collectives, covering a 100 foot area. The swarm rolls 3d10 to Attack and does 3d10 wounds. Swimming Priestess is a spirited fish, and looks like a giant blue and black pike fish, with spines on her back. She can also take the form of a strange woman but her hair is always too long and wet. Swallow: On a Successful Tongue attack she can swallow a person. Every round spent in her stomach does 1 Automatic wound to the person inside. To cut through, one must do enough damage to kill Swimming Priestess. Climbing out is possible on a successful Athletics Roll (TN 10). Ram/Squash: She can ram or squash people by leaping onto their bodies for 6d10 Damage. Shape Change: Swimming Preistess can take human form and when she does, appears as a human Yen-Li priestess. Immunities: She only take Damage from Kung Fu Techniques Qi level 3 or greater that involve energy Attacks. Weapons that are finely crafted can also harm her. Eye Burning Ink: She can release a terrible black ink into the water. Anyone who is exposed. Roll 4d10 against Hardiness. On a Success they take 3 wounds and if they are submerged, their eyes melt. Venomous Spines: Swimming Priestess has poisoned spines on her back. She can fling these at targets. Roll 3d10 against all targets in a 50 foot area. Anyone struck is exposed. Roll 3d10 against Hardiness. Each day the affected person loses a point of Resolve and Wits and finds their memories fade. This can only be reversed by administering her Snapping Shrimp Pill Antidote. This dense forest is hot and has a heavy canopy and thick floor strewn with roots and moss. The trees here are particularly large. The forest is inhabited people with hairy bodies, teeth and claws, called simply The Tiger People. It is also inhabited by the Great Tiger God of Sua Pa. This enormous creature stands about fifteen feet tall and is fifty feet long. These folk looks like humans but with lion or tiger-like heads and bodies covered in yellow fur. They have sharp claws and eat meat (human being one of their preferred dishes). However, they always artfully prepare their meals and respect the lives they must take to sustain themselves by adorning their homes with the bones. Otherwise they look and behave like men. The Tiger People live in small villages and often travel in hunting parties through the forest. They worship The Great Tiger God and bring him regular offerings of metal work and jewelry (the latter they acquire through trade). The Great Tiger God of Sua Pa (often just called Sua Pa) is a gigantic tiger with a 50- foot long body. He stands 15-feet tall at shoulder height. According to legend he was once the pet of the Enlightened Goddess but was cast out from Heaven when he bit one of her consorts in the leg. Though very powerful, the Great Tiger God of Sua Pa is not highly intelligent. He can speak and communicate, but has very little interest in scholarly matters. He likes shiny objects and is intensely jealous of Jade Tortoise and South Wind King (because people often bring them better offerings and gifts). As a rule, he kills and devours anyone who does not present an offering to his liking. Flattery works well on Great Tiger God of Sua Pa.
Pounce: When Great Tiger God of Sua Pa has Surprise, he does one Extra Wound on its Damage roll. Beast Strength (x15): Multiply base lift by 15. Can also exceed damage cap up to 10d10. Claws: Anyone Struck and damaged by his claws bleeds heavily, suffering 5d10 damage for three rounds. Blasting Breath: Sua Pa can unleash a great fiery fur ball at will. It tumbles from his mouth and burns any in a path of his choosing. Roll Burn against Evade of anyone within 100 feet. On a Success the target takes 7d10 Fire Damage. Immunities: Sua Pa cannot be hard by sword, foot or fist (only people with Qi equaling his own can harm him by these means). However he is affected by Dianxue Techniques. Regeneration: Sua Pa regenerates 1 wound every minute. This dreary swamp surrounds the palace of Jjiangnu and protects her from the effects of the south. There is a powerful creature in the swamp called the Passionless Goddess. If you feel any stir of passion, love, attachment, she ensnares you in her hair and drags you to die in her mouth. She appears as an enormous head, the size of an island in the swamp. Anyone traveling in the swamp must make a Meditation Roll TN 7 each day they travel. If anyone in the group fails, they have an encounter with the Passionless Goddess. A giant head with long hair that grabs people and pulls them into her mouth. There are actually countless Passionless Goddesses but most people believe there is just one entity in the swamp. Hair: She can attack up to 15 targets with her hair against parry. Bite: On a Successful attack her bite does 5d10 plus 3 Extra Wounds. On a Total Success the person is takes 5d10 plus 5 Extra wounds. Wicked Spawn: If anyone eats her flesh after killing her, they will grow a head out of their body that becomes a Passionless Goddess in 1d10 days. There is a 2 in 10 chance of encountering White-Browed Tiger here (see WAR OF SWARMING BEGGARS). This is a walled city that is quite large given its seclusion and demography. The inhabitants are all buffalo people. They are led by King Sharp Horn. King Sharp Horn is looking for a suitable wife, preferably a human. The Buffalo People have large, heavily muscled bodies and the heads of buffalo. They can be kind or cruel depending on how well they are treated. They reciprocate intensely, greeting kindness with hospitality and rudeness with hostility with bloodshed. Fierce Strike: On a Success you add +1d10 to the Damage roll. On a Total Success you add +4d10 to the Damage roll and can exceed the standard dice cap. Cathartic: Use on 3 targets in range. Whirling Dodge: Roll Athletics against Attack roll to reduce Damage by -1d10 (-2d10 on Total Success). Cathartic: Roll Athletics against Attack roll to avoid attack. Powers: Gore, Devour (heal 1 Wound for every inflicted by bite) and Shapechange. King Sharp Horn looks like a giant half-human, half buffalo with a long black horn on his head. He is the son of Lord Demon Horn. He is enormous and dresses in the fine robes of the Hai’anese gentry. Despite his beastly appearance he can be very gentle and charming when he needs to be. He always treats his guests fairly. His enemies he has made into a great stew and fed to his people. Mighty: All physical attacks by King Sharp Horn roll Open Damage.